← Arepas, For The Last Time! One of the worst things that can happen in the kitchen (outside of an injury, I suppose) is a baking failure. With other forms of cooking, mishaps can be corrected to a certain extent: burnt bits can be scraped off, seasoning errors may be corrected, recipes not up to par may be adjusted in the midst of cooking. But with baking, you have one shot to get it right, an arguably impossible task when dealing with things like, say, raw eggs and baking powder. This was my problem when I made these blueberry orange muffins previously. What seemed to be a perfectly respectable recipe (okay, I should’ve noticed and amended the tablespoon of baking powder) ended up in a batch of truly horrible muffins. It was like a plateful of unrepentant spite. And there was nothing, just nothing, I could do. But the basic idea of a blueberry muffin, brightened with orange and made nutty with oats, was too good to give up. And so, after severe modification, I bring you these resurrected muffins, now with actually good flavor. One major problem (aside from the amount of baking powder) was the awful, half-cooked texture of the oats. To solve that, I’ve given the oats a quick soak in buttermilk to soften them up a bit. Alternatively, you could process them finely in a food processor (but I killed mine whilst making marzipan, so that wasn’t an option). By soaking them, the unpleasant texture was done away with, while still retaining a slight chew from the whole grains. To complement the rustic texture of the oats, I substituted half the white flour for whole wheat flour. Additionally, I swapped flavorless vegetable oil for an equal amount of delicious, delicious butter, and increased the amount of sugar to a level that gives more of a muffin-y taste, but doesn’t over-sweeten the batter at all. I tossed in a bit of lemon extract, to boost the citrus flavor, and vanilla to give a bit of depth. Oh yeah, and I decreased the heck out of that baking powder; I would not like soap-flavored muffins please. Other than that, this recipe might actually make it into my permanent recipe file, with the aforementioned tweaking. Yes, it ended up that good. But then, when you’re working with blueberries, orange, and oats, you can’t really go wrong, now can you? 1. Preheat the oven to 400º F. In a large bowl, combine the buttermilk and the oats. Cover with plastic wrap, and let sit for 30 minutes while the oven heats. Meanwhile, grease 12 standard muffin cups, or line with paper muffin liners. 2. In a medium bowl, whisk together the flours, baking powder, baking soda, salt, and orange zest. 3. When the buttermilk-oat mixture is ready, and the oven fully preheated, whisk the egg, butter, brown sugar, orange juice, and extracts into the oat mixture. Add the dry ingredients, and fold together gently and quickly until almost combined. Add the blueberries, and quickly fold until just incorporated. 4. Divide the batter evenly between the prepared muffin cups. Bake at 400º F for 18 to 22 minutes, or until golden brown, and muffins feel firm when pressed lightly on top. Remove from pan, and transfer to a wire rack to cool slightly before serving. 1. 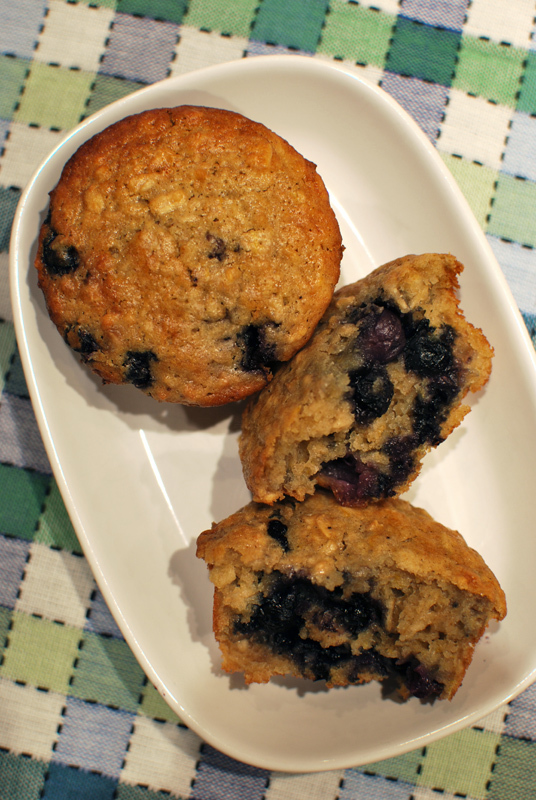 If using fresh blueberries, there’s no need to toss them with flour. If using frozen blueberries, tossing them with a bit of flour will help them stay suspended in each muffin, rather than sinking to the bottom. 2 Responses to Blueberry Orange Muffins, For The Last Time! Looks like something fun to try when I do a pick my own blueberries this summer. I never knew the tip about tossing them in flour to suspend, that’s awesome!